Lupita Nyong’o mesmerized the crowd at Monday’s Met Gala with her slinky green dress and hair that was perfectly sculpted. 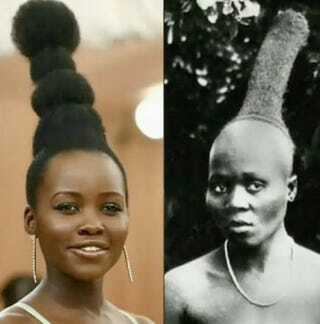 During her red-carpet interview with Vogue’s Andre Talley, Nyong’o said that her hair was inspired by “the sculptural hairdos from all around the continent.” And even Talley pointed out that it was reminiscent of Nina Simone’s hair. But apparently that wasn’t good enough for Vogue. Even after Nyong’o clearly said what the inspiration behind the hairstyle was, one of Vogue’s daft writers paid no attention to the magazine’s own video and assumed that the hairstyle was inspired by Audrey Hepburn. Of course Nyong’o wasn’t going to let that fly, and she used Instagram to respond to Vogue’s article. The actress posted a short video with photos of the people who actually inspired her hairdo. And not one photo was of Hepburn. The Vogue article was a slight not only to Nyong’o but also to the culture that Nyong’o always celebrates.